Artificial barrier that completely encircles a pool, protecting it from dirt, dust, insects, leaves, and other debris and also serving as a safety feature preventing those outside of it from falling in and possibly drowning. Many states have incorporated the U.S. Consumer Product Safety Commission's guidelines for safety barriers into their codes due to drowning accidents. Check with local authorities to see the requirements for your area’s building code/regulations. Screened enclosures cost approximately $15 to $25 per square foot. 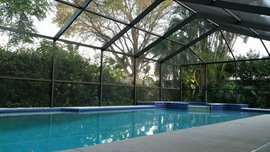 Glass enclosures cost between $45 and $65 per square foot and high-end glass enclosures with retractable roofs often cost $100 to $200 per square foot.